This time our attention is focused on writemyessay4me.org service. The company claims to offer a full range of guarantees, but we will check how this works on practice. Let us check the services, options, and prices in detail. The company is not offering a lot of possibilities. Actually, you can benefit from 2 services only: writing from scratch or editing. This means that if you just need a correction of your grammar and spelling (regular proofreading), you will need either to overpay for editing or to find a better service that offers a proofreading option. A quick analysis of the order form shows that it is quite simple, even too simple. Yes, we can see a wide variety of subjects, but the price does not change, no matter if we need an IT paper or a Literature one. The range of papers is much narrower, so you may not find the one you need in the list to order. There are no more options or extra features, with the only exception: you can pay for a better writer to work on your order. As far as the deadlines are concerned, this service is definitely not for urgent cases, since you can get your paper done no faster than in 12 hours. Prices are above average if you compare them to those of other services of the kind. The payment process looks safe, so you will not get any hidden charges as a bad surprise. It is necessary to make sure that you deal with a reliable service on good conditions before ordering. So, we have checked the terms and conditions of the service. The service offers 100% original papers on its main page. 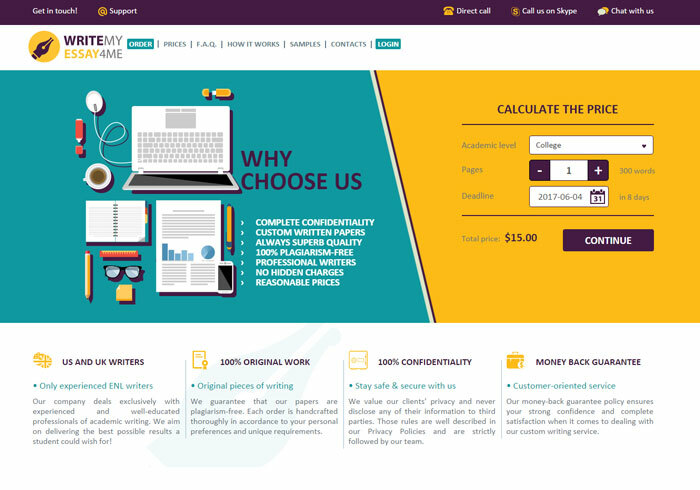 However, the money back policy claims that you can get a refund only in case you have a proof that more than 10% of the text are plagiarized. Are 9% okay then? This looks quite contradictive. The service offers 14 days for free revisions. However, the deadline for the fastest revision is nearly the same as the one for initial order. Thus, if you need your paper in 12 hours and if you need a slight amendment, you will need to wait for 12 hours more, which may be quite problematic. A good thing about this service is that in case of cancellation of the order in progress, you will get a partial refund, and the draft of what has been completed so far from your writer. So, you do not waste money. The bad thing is that you cannot get a refund for a poor grade since the service does not guarantee you success with the paper you get from them. As usually, we tried to place an order to see how the service works. We contacted support team via Skype, which was quite comfortable. We paid for 1 page completed within 12 hours at a High School level. In 12 hours, the paper did come, so the service is responsible for its deadlines. Although there were just a few grammar mistakes, there were a lot of inaccuracies with the word choice. It proves that an ESL writer was working on it, busting the myth that only ENL writers work for this service. In conclusion, we can say that we were expecting the above-average quality for above-average prices, and our expectations were not met. Revisions could have been completed by the same writer, but there was no point of going back and forth with ESL writer and his or her word choice. We would not recommend this service to our readers.